At the recent Law & Society Annual Meeting in Baltimore, I presented some early data from a project entitled "The Changing Economic Geography of Large U.S. Law Firms." Thus far, my research has been a multidisciplinary journey into such fields as economics, regional science, geography (dominated by U.K. researchers), and sociology. The literature that has surprised me the most are the multiple books, articles, and readers on "World Cities" or "Global Cities." In short, a Global or World City is a hub of international commerce. As production of goods becomes more dispersed, centralizing the logistics and strategy of the enterprise become more important. Ironically, a Global City is not defined by a large number of corporate headquarters per se; rather, its the presence of "advanced producer services"--investment bankers, accountants, consultants, advertising executives, and, of course, lawyers. There are lots of methodologies for defining and ranking Global Cities (e.g., concentrations of producer services; airline volume and connections; number of bank and stock exchanges, etc. ); but at least for lawyers, five U.S. cities always make the cut: New York, Washington DC, Chicago, Los Angeles, and San Francisco. Further, NYC is always number one. Some interesting graphics on this topic are below the fold. 1. Follow the Client. Firms are "following the client" to new locations, primarily as a defensive measure to preserve their existing client base. Under this theory, as the proportion of large corporate clients shifts to different regions of the country, large law firms will grow into these markets. 2. Follow the Lawyer. For some transactions, clients will "follow the lawyer" to Global Cities in order to obtain highly specialized services, especially pertaining to transnational business. Only the Global Cities have the critical mass of human capital necessary to develop and sustain this expertise. 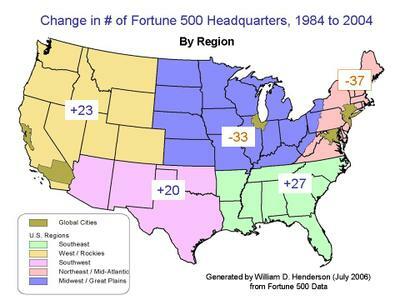 Under the "follow the client" driver, this graphic [click to enlarge] on the change of Fortune 500 HQs between 1984 an 2004 suggests that the Midwest and Northeast/Mid-Atlantic are losing to the Southeast, Southwest, and West Coast / Rocky Mountain regions. The disaggregated data certainly supports the "follow the client" theory. 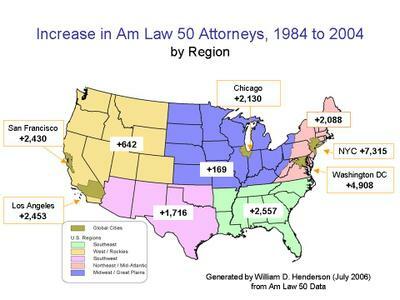 Between 1993 and 2003, small and medium-sized markets in these regions had lots of Am Law 200 entrants (# of offices opened): Houston (+16); San Diego (+14); Atlanta (+10); Dallas (+10); Charlotte (+10); Denver (+9); Miami (+8); Austin (+6). The primary upshot of this analysis, at least so far, is that the Northeast/Mid-Atlantic corridor has simultaneously lost a large number of Fortune 500 HQs (slightly more than the Midwest), yet has emerged--or consolidated its position as--the center of the large law firm universe. Although it accounts for only 30% of the Fortune 500 revenues, it has 48% of the Am Law 200 lawyers. This last table [click to enlarge] creates a statistic to measure the extent to which a region imports or exports its high-end corporate work. 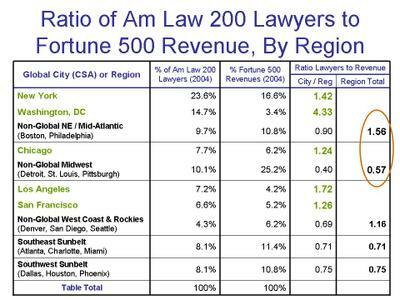 It is calculated by dividing a region's % of Am Law 200 lawyers by its % of Fortune 500 Revenues. For example, if a region contains 20% of the nation's domestic Am Law 200 lawyers and 20% of the nation's Fortune 500 revenues, its statistic would be 1.00. If the statistic is greater than 1.00, the region is a net importer legal work. If the statistic is less than 1.00, it is a net exporter. As shown in the table, all Global Cities are net importers. I have circled the statistics for the Northeast/Mid-Atlantic and the Midwest/Great Plains because it suggests two dramatically different fates for the two regions that have lost Fortune 500 HQs. When the data is disaggregated, some Midwestern/Great Plain regions are clearly doing better than others, and a few are doing quite well. But overall, the economic center of gravity for the country is clearly moving South and West. And for lawyers, its moving South, West, and to Northeast/Mid-Atlantic corridor. Shout-out: To my former research assistants, Brad Fischer ('06) and Mike McIver ('06), who geocoded nearly 700 locations in the U.S. Your data is exclusively American. An interesting question (perhaps the next project?) is whether or not these findings hold up in the EU, the other major center of legal professionals. A related question may be why London became such a legal powerhouse, as London based firm numbers dwarf those of German, French or other continental firms. Another question would be to examine the entry of non-US based firms into the US. Do they follow your overall economic geography model? I would guess that correspondent offices may be very highly concentrated in NYC for both European and Canadian firms. However, I could imagine that Latin American law firms might set up shop in Miami (or in the case of Argentine based Allende y Brea, Miami and Atlanta) and Japanese or Korean based firms on the west coast. As to the US data, your findings suggest a number of additional questions. If lawyers are following the clients, we should expect to see increased coverage in each of the global legal centers in the US for a given firm. However, in your previous work you note that the most highly profitable firms are reluctant to open new offices because it might dilute their per partner profits. Is it possible that a major transactional powerhouse need only have a presence in California and NY plus an optional DC operation that is high revenue regulatory work? Other than Skadden, none of the highly profitable NYC based firms have a Chicago presence. Is Chicago basically feeding off the decline of the rest of the Midwest or does its future outlook as a global center look more dynamic? Is there a distinction between corporate and litigation work? That is, is it possible to have a high end national litigation practice without the need to focus specifically in global legal centers (or perhaps just outside them like Southwest Airlines)? It seems to me that Boies Schiller would suggest that such a strategy is possible. Is Boies unique or a harbinger of things to come of high end litigation talent scattered in such places as Las Vegas, Ft. Lauderdale, Armonk and Short Hills? For the most part, the clients aren't following the lawyers; the lawyers are following the capital. Transactional lawyers need to be near the repeat business and the complex business that financial institutions and hedge funds provide. The Fortune 500 companies who use the lawyers on an episodic basis then come to the lawyers.